A new translation of a Zen classic... The Shōbōgenzō is the recognized spiritual masterpiece by the thirteenth century Japanese Sōtō Zen Master Eihei Dōgen. It is comprised of discourses that he gave to his disciples, in person or in writing, at various times between 1231 and his death twenty-two years later at age fifty-three. These discourses cover a wide range of topics pertinent to those in monastic life though often also relevant to those training in lay life. He discusses matters of daily behavior and religious ceremonial as well as issues involving the Master-disciple relationship. He also explores the deeper meaning that informs the so-called Zen kōan stories, which often puzzle readers by their seeming illogicality and contrary nature. I have translated the title as The Treasure House of the Eye of the True Teaching, though a fuller, more comprehensive rendering would be The Treasure House for What the Spiritual Eye of Wise Discernment Perceives from the Vantage Point of the True Teachings of Shakyamuni Buddha and His Heirs. The term ‘Teaching’ in the title is synonymous with the Buddhist use of the term ‘Dharma’, which refers not only to what the historical Buddha taught to His disciples but also to the Truth that flows from the Unborn and which all things give expression to when they are functioning directly from their innate True Self. However, it does not address what may be a scholar’s particular interest in producing a translation, though it is obvious that translating anything from medieval Japanese and Chinese requires special academic training: hence the subtitle “A Trainee’s Translation of Great Master Dōgen’s Spiritual Masterpiece”. That is, it is intended primarily for those who practice Zen Buddhism rather than those whose interest is purely academic. The discourses were originally written out by hand, primarily by his chief disciple and amanuensis, the Second Japanese Sōtō Zen Ancestor, Kōun Ejō. Most of the discourses have a two-part postscript (printed in italics, usually at the end of a discourse). The first half indicates who the recipients of the discourse were, along with when and where it was presented. If this is signed, it will customarily be by Dōgen. The second half supplies a short account of when and where the copy was made. These copies are most often signed by Ejō, though three were signed by Giun, one of Ejō’s Dharma-heirs who later became the fifth abbot of Dōgen’s Eihei-ji Monastery. Shasta Abbey provides opportunities for Zen Buddhist meditation, spiritual training, and mindfulness practice at introductory and advanced levels in both lay and monastic training. Established in 1970 by late Reverend Master Jiyu-Kennett, Shasta Abbey is a Buddhist monastery in the Serene Reflection Meditation (Soto Zen) tradition and is a temple in the Order of Buddhist Contemplatives. 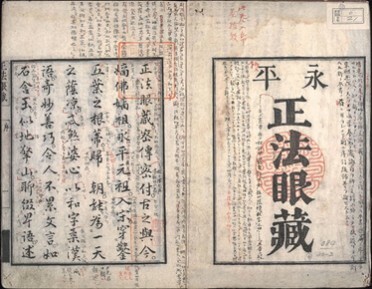 Title page of an 1811 edition of Dōgen's Shōbōgenzō. The Shōbōgenzō (正法眼蔵, Shōbōgenzō? lit. "Treasury of the True Dharma Eye") is Dōgen Zenji's collection of Zen Buddhist fascicles, written between 1231 and 1253 -- the year of Dōgen's death (Dōgen, 2002, p. xi). Unlike earlier Zen writings originating in Japan, the Kana Shōbōgenzō was written in Japanese -- not Chinese. Other works by Dōgen, notably the Eihei Koroku and the Shobogenzo Sanbyakusoku, are written in Chinese. Shobogenzo Sanbyakusoku consists of over 300 Koan (open cases), and is distinct from the Kana Shōbōgenzō discussed herein. Modern editions of Shōbōgenzō contain ninety-five fascicles, though earlier collections in the Soto Zen tradition varied in number (seventy-five, sixty, twenty-eight). Dogen himself considered only 12 of these fascicles to be complete. The essays in Shōbōgenzō were delivered as sermons. Some of the fascicles were recorded by Dōgen, while others were likely recorded by his disciples. The Dōgen Zenji Zenshu contains all 95 Japanese fascicles, untranslated. The Nishijima/Cross translation, Master Dogen's Shobogenzo, and Shobogenzo, The Eye and Treasury of the True Law, by Kosen Nishiyama and John Stevens, are the only English translations of the complete Kana Shobogenzo. The Stanford-based Soto Zen Text Project, an ambitious project to translate Dogen and other Soto texts, has completed several fascicles, and many other translations of individual fascicles are available. 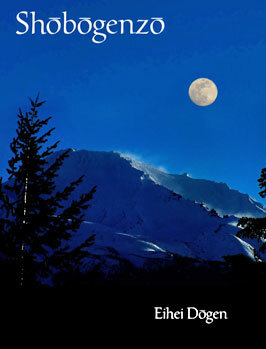 Shasta Abbey is also translating the complete Shobogenzo and other Soto Zen works.